IDW Publishing is more than just returning to all the properties you thought were awesome as a kid. They've also got some original stuff brewing, including Satellite Falling set to debut in May. The sci-fi themed crime drama gives writer Steve Horton and artist Stephen Thompson (colors by Lisa Jackson) the chance to introduce readers to unique aliens, settings and characters. Satellite Falling marks Thompson’s creator-owned debut. In addition to Horton’s standard cover for issue #1, retailers can also order a Variant Cover from Judge Dredd artist PJ Holden in addition to a Retailer Incentive Cover by June Brigman. There will be plenty more variants on hand for future issues as well. Full press release below. 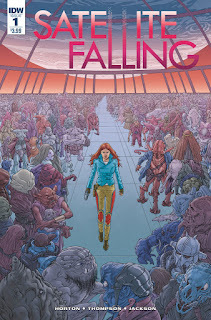 San Diego, CA (February 11, 2016) – Satellite Falling, the latest original series on the horizon from IDW Publishing, kicks off this May, a month replete with creator-owned launches from the publisher. The sci-fi-themed crime drama introduces readers to unique aliens, settings, and characters, wildly imagined by writer Steve Horton (Amala’s Blade), beautifully rendered by artist Stephen Thompson (Star Trek, Brooklyn Animal Control), with vibrant coloring by Lisa Jackson (Angel). Satellite Falling tells the story of a lone human bounty hunter who jettisoned off her home planet after losing the love of her life, and now resides on a satellite spaceport full of aliens. Life, as she knows it, is about to take a turn for the surreal. As mentioned, joining Horton on this off-world adventure will be his newest collaborator, Thompson, whose otherworldly art will effortlessly transport fans to an eye-catching universe like no other that instantly setsSatellite Falling apart from other sci-fi sagas. In addition to Horton’s breathtaking standard cover for issue #1, retailers can also order a Variant Cover fromJudge Dredd artist PJ Holden in addition to a Retailer Incentive Cover by June Brigman (Power Pack). That’s just for starters with more exciting variants on the way for future issues! Satellite Falling will crash land at your local comic shop this May!